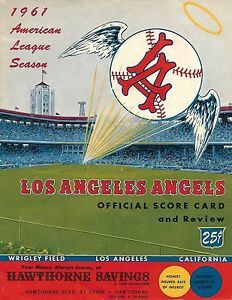 Hooray, the Jays snapped an ugly losing streak last night by piling up five runs in the first inning and then fending off the Angels the rest of the way to hold on for a 5-3 victory. J.A. Happ turned in a sorely-needed excellent outing to record the victory and then Ryan Tepera and Tyler Clippard closed the door. Aaron Sanchez is 0-1, 3.24 in two career starts against the Angels. His counterpart, Tyler Skaggs, is 2-2, 3.86 in four career starts against the Blue Jays. Can the Blue Jays avoid getting bludgeoned right into the ground by a Trout-led squad hell-bent on securing revenge for last night's loss? Stay tuned! It's rare that there's no roster moves to announce for today that I just has to mention it on here! I read somewhere that there had been only four days in all of May that a roster move didn't take place before today. The latest roster move was Devon Travis coming up yesterday to take over for Richard Urena, who had been sent down after Sunday's game. Chris (St. Catharines, ON): With Cavan Biggio's swing changes and the production that's come from them early this season, how much has his ceiling gone up in your opinion? Is it still more of a second division regular profile or is there a chance for more than that? Ben Badler: I've seen him a bunch this year. I thought he was a borderline org guy coming into the year. He's totally changed my mind. The power is real, he has a patient approach and puts together a lot of quality at-bats. There are some swing holes where you can beat him and it's more of an offensive-minded profile, but the patience/power combo play well enough to give him a chance as an everyday 2B. Steve (London): What do you see as Vlad Jr’s offensive ceiling? Ben Badler: An MVP. He could win a batting title, lead the league in OBP or slugging. When we dropped an 80 future hit tool on him last year, I know that surprised some people, but I think everyone's seeing it now. He is such a complete hitter, it's amazing to watch from a 19-year-old. Kevin (Toronto): Thanks for posting the video of Vlad doing his defensive work the other day. Cool to see stuff we dont normally get to watch. Do you think he can stay at third base? Ben Badler: Thank you, I appreciate it. That video got a great response. I had people in the game message me to say how it meant a lot to them for me to share an example of the work that coaches and players put in that doesn’t typically get recognized, so it’s cool to see how many fans responded so well to it. I'm hoping that’s something I can find more ways to do going forward. I do think Vladdy has a chance to stick at third early in his career. He has the arm, his hand-eye coordination and body control/awareness are assets over there, he’s just such a big guy that it limits his first-step quickness and range. Eventually I think he outgrows the position, but if he keeps working at it, I do think he can start his major league career as a third baseman. Luis Medina (Thinly veiled self advertisement): Which short season pitcher are you most excited to see? Vlad Guerrero Jr. (New Hampshire): When am I called up? June after the Super Two deadline or more likely in September when rosters expand. Ben Badler: I don't know. The Blue Jays really don't know yet either. I think they overestimated their playoff chances this year, missed on an opportunity to reset the organization in the offseason and didn't expect Vlad to be hitting demolishing Double-A like he is right now, so they're still figuring out what the best plan is for the organization and for Vlad's long-term development. 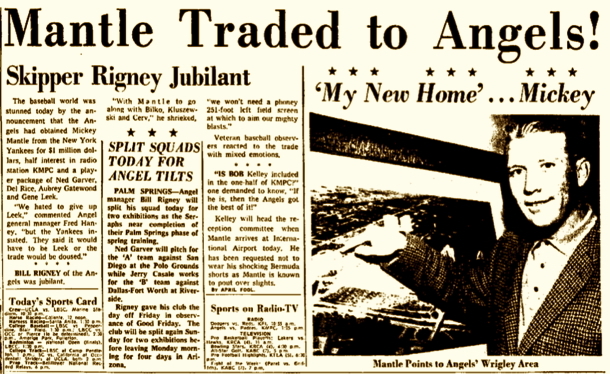 Yup, a newspaper article announcing that Mickey Mantle had been traded to the expansion Angels for $1 million in cash, half-interest in radio station KPMC and a player package of Ned Carver, Del Rice, Aubrey Gatewood and Gene Leek. Oh... it was April's Fool Day. But, man, could you imagine if that happened today? Twitter would be in full-blown meltdown mode. This is your "Trout and Ohtani Show" game threat. Kick back and enjoy it while you can.